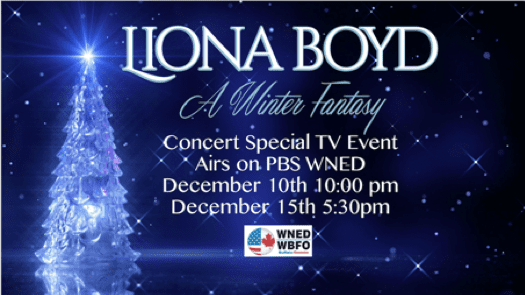 27 November 2018 (Toronto, ON) – Liona Boyd to welcome the holidays with A WINTER FANTASY Concert Special on PBS flagship station WNED serving viewers in Toronto, Buffalo and Southern Ontario. The Christmas concert showcases the music from Liona Boyd’s album, A Winter Fantasy, released in 2014 via Universal Music Canada, the country’s leading music company. World-renowned classical guitarist and five-time Juno Award winner Liona Boyd with her protégé, Andrew Dolson and guests Ron Korb and The Chancel Choir perfectly capture a magical evening in the concert A Winter Fantasy airing at on WNED-TV and several other PBS stations. Airdates are Dec 10 at 10:00pm EST, Dec 15 at 5:30pm EST, Dec 15 4am EST and Dec 25 at 4am EST. Ever since her platinum album, A Guitar for Christmas, Boyd’s music has been part of the holidays. A Winter Fantasy is a one-hour concert film that interweaves beloved traditional pieces, such as “Silent Night” and “The Huron Carol,” with Boyd’s own original material and the ethereal orchestrations of Peter Bond. Dolson accompanies Boyd on guitar and vocals as well as giving soaring operatic vocal renditions of “O Holy Night” and Boyd’s own epic “Aurora Borealis,” a tribute to the beauty of the northern lights. Recorded in historic Richmond Hill United Church in December 2017, A Winter Fantasy also features special guest, Grammy nominated flautist Ron Korb, as well as the Chancel Choir of Richmond Hill. Korb adds his acclaimed playing on two pieces, and The Chancel choir joins along with the exuberant Caribbean rhythms of “Christmas Dreams” to close out this special concert. Stunning winter scenery from Boyd’s homeland of Canada add visual beauty to the production. 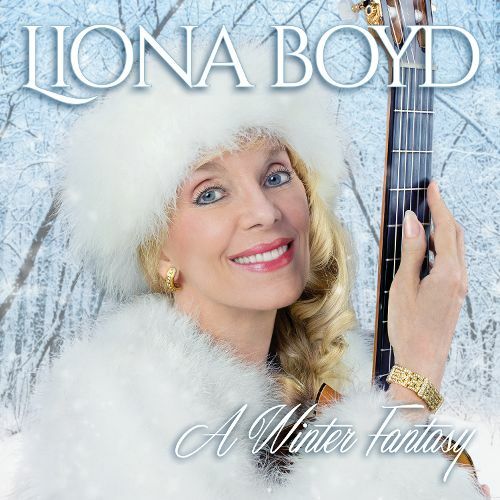 A Winter Fantasy brings to the screen Boyd’s unique blend of romantic style and serene classical guitar music. Liona continues to tour, including 14 concerts she just performed around Ontario in November 2018. Liona Boyd’s autobiography ‘In My Own Key’ became a best seller and is now for the first time released as an Audiobook on November 28, just in time for the holiday season. Exotic venues, sold out concerts, and the companionship of the world's most powerful people have given Liona Boyd an adventure-packed lifestyle that, like her music, is one in a million. The internationally acclaimed classical guitarist has crossed numerous boundaries, both musically and romantically. In this colourful memoir she serves up a rich and fascinating mix: childhood with her progressive parents in England, Canada, and Mexico, exacting music studies in Toronto, down-and-out years in London and Paris, her eight year love affair with Canadian prime minister Pierre Elliott Trudeau, drug experimentation in a Mexican artists’ colony, her recitals for the British Royal Family, her friendship with HRH Prince Philip, official performances for many heads of state, behind the scenes glimpses into her privileged years in Malibu and Beverly Hills, and whirlwind trips around the globe to eminent concert stages. It all makes for a rousing, feisty, passionate tale, as compelling and entrancing as the music of her guitar. "Her music, talent, and courage have woven a magic carpet that has floated through some of the most interesting corridors of our century." audible.com, audible.ca , BN.com (Barnes & Noble), Amazon.com, BlackstoneLibrary.com, Audiobookstore.com, Itunes.com, www.GooglePlay.com and many more outlets around the world.